Hey Roadies! Our latest fabulous kit, Life's Journey is now shipping and has some new (and absolutely free & beautiful) digital cutting files to go along with it! Are you ready for some great files to make your crafting easier? You'll be able to use these beautiful and classic files over and over! Even better, they coordinate with our latest Mini Album Kit release, Life's Journey. All of it is designed to get you crafting and chronicling one of the journeys or paths your life will take. We have SIX great cutting files to share this time around that we know you're going to love! These cutting files are all inspired by the Life's Journey kit and classic Maya Road style! While they work perfectly with the coordinating kit, be sure to use them over and over. These digital cutting shapes will work great on layouts and other projects as well. That's the beauty of digital files...they can be used limitless times! Click on links below then right click to "save as"
Looking for a great tutorial on how to use the cutting files in a Silhouette or Cameo machine. There's a wonderful easy tutorial here. While you're here, don't forget about the coordinating kit, Life's Journey. This gorgeous kit is inspired by travel, summer fun and all the journeys in your life. It is full of absolutely stunning product and exclusives that you can't find anywhere else! Life's Journey is available for purchase here. If you've already purchased our Life's Journey kit, thank you so much! It is already shipping and should be on your doorstep soon! Enjoy the digital cutting files and happy creating! Mini Album Kit: Life's Journey Release Get Your Today! Ready for some creative travel? Check out our latest kit from Maya Road! Life's Journey is a stunning mix of fun travel themed product. It's perfect for documenting those summer or tropical travels, an adventure, a life journey or even a spiritual one. Whatever you plan to chronicle, with Life's Journey your destination will be creative fun. Life's Journey is a fabulous mini album kit that's absolutely full of gorgeous product. We're excited about the unique color combo, tons of wonderful chipboard and know you're going to love all the beautiful tickets and charms included in this kit! There are just so many other wonderful inclusions as well. Life's Journey has all you need to create an entire mini album with lots to spare. The chipboard album, papers, trims, journaling cards, flair and fun exclusives make it easy to just open the package and get creating. All our kits are limited edition so if you want it, make sure you purchase it right away. Quantities are limited. 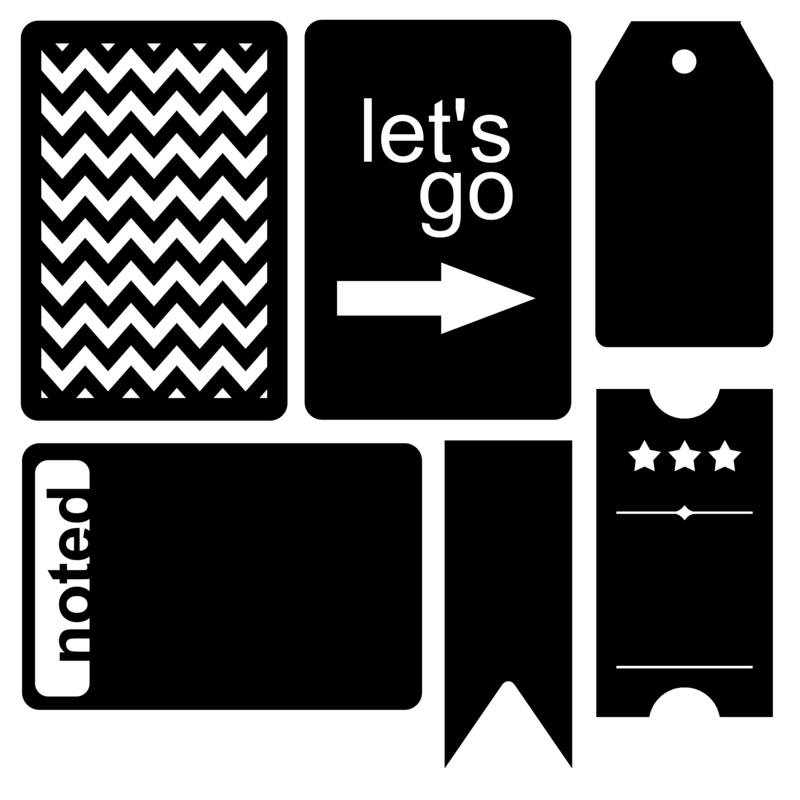 Everything in the above image is included in the Life's Journey Kit as well as the 6" chipboard mini album to complete the project. We think you'll agree it's a pretty amazing kit and what's even more incredible is the price! Full of more than $62 of supplies, we're selling it for only $33.99 plus shipping ($5.75 in the US). Our Life's Journey Kit Add-ons. So many of the products in the Life's Journey Kit are just so wonderful we thought you might want to be able to purchase a few extras. Purchase any or all of the add-ons at the same time you purchase the kit and we'll mail them at the same time with no additional shipping charge! For each kit we put together, we design exclusive wood items to go with it. These beautiful tokens and buttons coordinate perfectly to the Life's Journey Kit. We think you're going to love them and want extras. If you do, this add-on is for you! It includes two of each of the wood pieces so that you can add them to other projects as well. Our custom Maya Road kit flair is always a popular add-on! 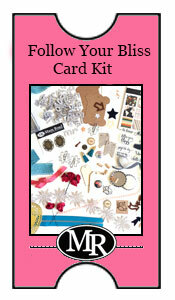 These pieces are also exclusive to this kit and make beautiful embellishments for your crafting projects. Check out our exclusive anchor sequin charms! These beautiful accents add a great touch of shine and pizazz. They are perfect for travel, summer and masculine themed projects especially and come packaged in a darling little Maya Road tin! Our Kraft Envelopes are always a popular basic item. They are perfect for adding pockets to your mini albums, decorating layouts, filling with momentos or even sending sweet gift cards or notes. Do you love personalizing your crafting projects? This beautiful Handmade & Original self-inking stamp is exclusive to Maya Road kits and there are only a few left. Get yours before they are gone forever. For this kit we were excited to put together a custom selection of beautiful papers and journal cards. These papers and journaling cards are included in the kit but this add-on gives you the option of creating more projects with them. The add-on includes eight 12x12" papers and a set of six journaling cards. Last up is this beautiful tangerine seam binding. Note that this particular seam binding is NOT included in the kit but we thought that it coordinated so beautifully that we just had to offer it to you. The seam binding comes rolled on a darling little wood spool making it easy to store. If you're looking for samples of what you can create with this kit, look no further! THREE different designers have created unique mini albums to inspire you. Simply click on the following photos and you'll be linked right to their coordinating galleries. Each gallery has full instructions to complete each mini album. This kit will ship starting June 12th so you'll be able to get started right away! Hi Roadies! 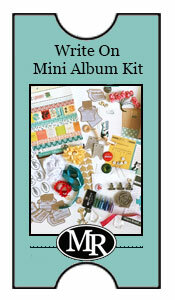 It's almost time to say hello to the new Life's Journey Mini Album Kit and say bon voyage (good travels) to creativity! Can you believe all these absolutely beautiful goodies in one kit?! The fact is, this is still a sneak peek meaning there's lots MORE wonderful product in this kit that is not shown. We've been sharing a few project peeks over the past couple days and here's a totally different option to inspire you. We love how each of our designers has created a completely unique mini album. Which one will inspire you? You can also take your own unique creative journey and design something with the kit that is totally unique to you! Behind the scenes we are just about ready to go! We can't wait to share Life's Journey with you tomorrow! Release time is Wednesday June 10th at 11 am EST! Right here! Hey Roadies! We're back with a couple more peeks at the upcoming Life's Journey Mini Album Kit. Just a couple more days until the release and we are busy behind the scenes getting everything ready to go. Release time is Wednesday June 10th at 11 am EST! Right here! First up is another peek at some of the many embellishments and wonderful things in this kit. There's an amazing chipboard album to get you started on your mini album and so many pretty pieces to finish it off. We are totally crushing on that darling little Eiffel Tower charm. Seriously, it's adorable! There's also lots of wonderful wood embellishments in this kit including rulers, spools and some exclusive wood tokens and buttons. You can see just a peek at one of them in the bottom of the shot. Designed especially for the Life's Journey kit, it says, "for the journey of a lifetime." We thought you'd like to see another project picture as well and here's a page from the mini album we shared with you yesterday. The instructions for this project share how to create a pocket page in your album and finish it off with our gorgeous trim! Check back in tomorrow for our last day of sneak peeks! See you then! We're back with another peek at the new Life's Journey Mini Album Kit! You've seen a few of the product sneak peeks and we thought it was time to share a couple peeks at one of our design samples using this kit. Each kit release, we ask three designers to create with it. It shows the amazing versatility of our kits and gives you lots of unique and wonderful ways to use them! You can copy one of the samples or just be inspired and create your own and personal work of art. Today we've shared a couple peeks at the cover and one of the inside pages of one of these design samples. We love how this designer has stamped dates on the tickets and the beautiful way she finished the chipboard title. There's more to come though so be sure to visit our gallery once the kit goes live! Life's Journey has a wonderful travel theme to it. It's perfect for summer or a special trip you want to chronicle. It's even perfect for a graduation mini or some other accomplishment in your journey through life. Release time is Wednesday June 10th at 11 am EST! That's right here on the Maya Road Kits blog. Don't miss it! Hey Roadies! We're back with another sneak peek of the new and upcoming mini album kit. It's called Life's Journey and we can't wait for you to make it part of your creative journey this summer. Today we're giving you a peek at all the delicious papers included in this kit. It's a fun travel theme mixed with florals and classic prints that we think you are going to love. It makes for a unique color combo and depending on which sides you mix and match, you can get an entirely different look. This kit includes 7 different double-sided 12x12 patterned papers which means an amazing 14 prints in all. There's also tons of embellishments that are just the ticket! Lovely chipboard scallop frames, exclusive wood buttons, tulle trim, wood spools and some absolutely fabulous coordinating charms. Check out that little Eiffel Tower charm! Today we also have some release details to share with you so get out your calendars and mark it down! Release time is Wednesday June 10th at 11 am EST! That's right here on the Maya Road Kits blog. See you tomorrow for more sneak peeks! Life's Journey: The Sneak Peeks Begin! Hey Roadies! We have a new kit on the horizon and it's just in time for summer! It's called Life's Journey and it's perfect for your summer travels, art journaling or simply chronicling your thoughts and journey through life. We think you're going to love the fun and unique color combo and the tons of fabulous exclusives in this kit! Check out the darling silver anchor sequins, those fabulous orange tickets and that beautiful wood globe token. There's also cool things like shipping tags, tulle flowers, kraft envelopes and that's just the beginning! Stay tuned as we share more sneak peeks each day! The Life's Journey kit will be released early next week. More details to come tomorrow!